Donna Renzetti (left, standing) Vice President, Corporate Services and Chief Financial Officer at West Park Healthcare Centre came in on a Saturday to make sure there were plenty of chairs at the ready for the Trillium Gift of Life Network (TGLN) presentation on organ and tissue donation and transplant. She needn’t have worried: the gathering group were all wheelchair bound – or rather, wheelchair liberated (depending on your point of view) with the range of wheelchairs equivalent to a high-end car collection, complete with customization. I’m a public member on West Park Healthcare Center’s Palliative and Supportive Steering Committee, and am always up for attending education sessions that can increase my knowledge and understanding of end of life concerns and issues for their residents. These good folks, for whom day to day living is their first priority, were interested in learning about organ and tissue donation. 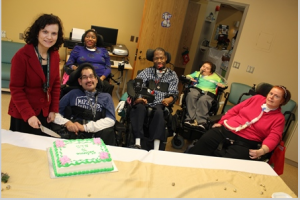 Their home is the complex continuing care section of West Park Health Center and many live with terminal degenerative conditions like Lou Gehrig disease (ALS) , Lung Disease (COPD), stroke, traumatic brain injury. Restricted and diminished though these West Park residents may appear to me – it’s clear they know exactly with whom they want to sit and are affectionate and caring with one another – communicating by various means. Anyone can become an organ and tissue donor, regardless of age or health status. Donation is dependent on how you die, organs have to be ‘healthy’. Donation requires death while on a ventilator (breathing machine), while in a hospital. Hence only about 2% of people will die in a manner that allows them to donate. Bone donation also has many different applications, and can be used for dental accidents and fractures. Heart valves often go to children with heart issues. Eyes can often be donated: corneas aren’t affected by poor eyesight. Even if organs can’t be donated for transplant, you can still donate your body for medical research. All major religions supports organ and tissue donation, and both Pope John Paul II and Pope Benedict XVI have come out strongly in favour of donation. Oldest organ donor was 90, the oldest tissue donor was 101. Funeral homes are well versed and well-trained to mask any marks or scars. Bone donations come from the long bones in arms and legs – both which can be covered. Even with eye donations, most funeral homes put caps in eyes. Organ donation only happens in hospitals, not in rehab, complex continuing care, long-term care or nursing homes. At time of death, your health condition may be different than when you decided to be a donor – so an assessment for ‘eligibility criteria’ is done again at time of death. A wheelchair-liberated woman with speaking aid has asked this. The answer, alas, is yes – which speaks to the importance of registering consent to donation and then making your wishes clear to loved ones. When family members are aware that a person is a registered donor, they consent to donation 90% of the time, but when a potential donor is not registered, the rate of consent drops to about 60%. Perhaps if families realized they’re heroes, too, they wouldn’t want to over-rule. TGLN recognizes that the family members left behind are heroes for making the decision to selflessly save the lives of others at an extremely difficult time. While family members consistently say that knowing some measure of good has come from tragedy is a huge comfort, TGLN holds annual regional memorial services to honour the courage of every family who has consented to donation.